This grilled salad is just as good at room temperature as it is hot of the grill. If you don’t have a grill, you can roast the potatoes and green beans in the oven instead. Heat a grill for a medium-high flame. Cut the potatoes in half lengthwise, and place them in a pot of generously salted cool water to cover by 2 inches. Heat the pot on the stove over high heat until it boils. Reduce the heat to medium-high and boil for 4 minutes. Drain thoroughly. Blanch the green beans in salted boiling water for 2 minutes. 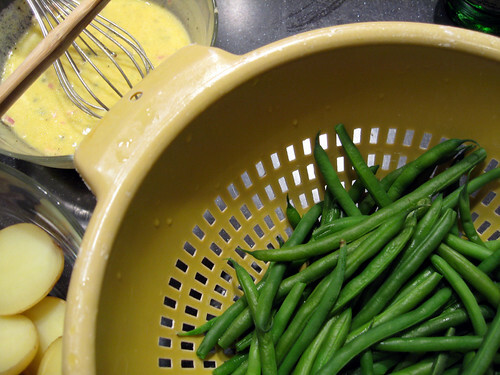 Drain and immediately run under cold water or submerge in an ice bath to stop the cooking and retain the green color. Drain thoroughly. Meanwhile, whisk the mustard and vinegar in a small bowl. Whisking constantly, slowly add 3 tbs olive oil. Add a pinch of salt and several generous turns of black pepper, and then the shallot and capers. Stir to combine. Now, sprinkle the potatoes and beans (separately) with salt and freshly ground pepper, and then toss each with one tablespoon of olive oil. Grill the potatoes over medium high for about 10 minutes, turning once, until cooked through. Leave the lid of the grill closed for most of the time. About 5 minutes into the potato cooking time, add the green beans to the grill (being careful not to drop them through the cracks! use a rack if you have one). 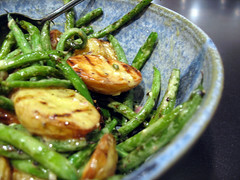 When the potatoes are cooked through and crispy, and the green beans are lightly charred, transfer to a large bowl and toss with the mustard-vinegar dressing. Taste and adjust seasonings as necessary. Serve immediately. Note: The potatoes, green beans, and dressing can be prepared 1 day ahead. Store separately, and simply bring to room temperature and toss them together just before serving. This entry was written by plutoniclove and posted on July 28, 2007 at 2:07 pm and filed under Eating In, Savory, Vegetarian. Bookmark the permalink. Follow any comments here with the RSS feed for this post. Post a comment or leave a trackback: Trackback URL. wonderful article and therefore I personally ended up being quite content to discover the article.